A computer on module, or CoM, now more commonly referred to as a System on Module (SOM), is a complete computer designed to fit on one printed circuit board. Critical Link provides a range of CoMs through its MityDSP family. 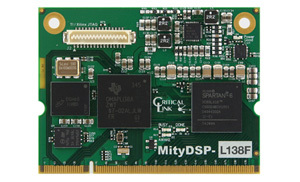 The MityDSP CoMs are highly-configurable, small form factor embedded CPU engines that combine DSP and/or FPGA and/or ARM processors. These CoMs are optimized for custom data collection and processing, and meet the requirements for a wide range of industrial and scientific applications. CoMs are generally used as an option for tasks that require a small embedded computer with customized I/O. To be considered a CoM, a board needs to have a microprocessor, RAM, an I/O option, flash memory, and Ethernet. Many variations on this set exist. CoM boards are generally used in embedded computing tasks that require squeezing the power of a full computer into a small space – sometimes with a requirement for low power draw. Typically, CoM boards do not come with standard connectors for interfacing peripherals directly onto the board due to size constraints, though they do usually have the wiring options to attach devices to the connectors that are present. This method allows for maximum flexibility in the system, allowing the system designer to place the connectors for the required I/O in locations convenient for the end product. CoM boards come in several form factors and sizes, though as a general rule the assembled board is usually smaller than four inches long by two to three inches wide.